"Say a number into the Mic to fire at that square. If you hit a Pink Boo, you'll earn points." "Pink Boos with crowns are worth 3 points! Hit them at all costs!" 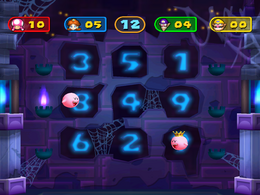 Controls Mic: Say: "1", "2", "3", "4", "5", "6", "7", "8", "9"
Mathemortician is a four-player Mic minigame in Mario Party 7. Its name is a portmanteau on "mathematician", a person who deals with numbers, and "mortician", another word for undertaker. The four players stand in a row. The first player walks up to the cannon to take a turn. Players must say numbers into the mic to shoot at the Pink Boos that float by. Regular ones are worth one point, while those wearing crowns are worth three. The players stand in a row as the winner does his/her victory animation. This page was last edited on August 26, 2017, at 18:54.